The original Compasses public house. It was demolished and rebuilt this same year. The new building (which ended its pub days as the Joseph Benskin)is now a Moss Bros outfitters shop. Duddenhill - a house name that I know well, as I do the Fisher family name. In 1955 as a youngster I moved to Stratford Road Watford, into a new family home designed by my architect father. It was built on the purchased garden of a large house that was fronted on Park Road, next to the Stratford Road junction. On the other side of our new house and garden was a property called Duddenhill, including a grand house built I would think in the 1920s by the look of it. The occupant was a wealthy widow, Mrs Fisher. So, it seems that the Fisher family retained the house name when their previous residence that you mention in Clarendon Road (let's call it Duddenhill no 1) was sold and demolished. (At one time, Clarendon Road was pretty much entirely a road of grand houses from the Junction Station up almost to the High Street). Later (1963) we moved to Watford Heath and old Mrs Fisher bought our house and moved into it from next door as she had found her house too big. Our house had been called The Garden House but she re-named it Duddenhill (the 3rd one). It's no 25 Stratford Road. Her original Stratford Road Duddenhill is still there (I guess with a different name or just a road number) but the lower part of its garden that ran down to Langley Road was sold and St Thomas United Reformed Church was built there. On Mrs Fisher's death or some time soon thereafter, more than half of the garden of the latest Duddenhill (once our Garden House) was sold off for development and thus yet another house now sits between Duddenhills nos 2 and 3. A A Fisher became a big wholesale and retail butchers business with many outlets. These days it has just one small (but very good) shop in Gerrards Cross. I believe that they still have a wholesale butchery near the bottom of Wiggenhall Road Watford by the railway line. About 1956 when just 5 years old a nearby friend of mine was Billy Fisher. Not surprisingly he lived in a big house with fine grounds (inc donkeys in a pen) in Nascott Wood Road Watford. Bill I think is MD of Fishers now but possibly beginning to take a bit of a back seat for younger generations. RW 2014. Watford Parish Church, St.Mary's, centre of the town's activities for hundreds of years. Grade I listedbuilding. Holy Rood Catholic Church in Market Street, completed in 1897 with the distinctive tower added three years later. 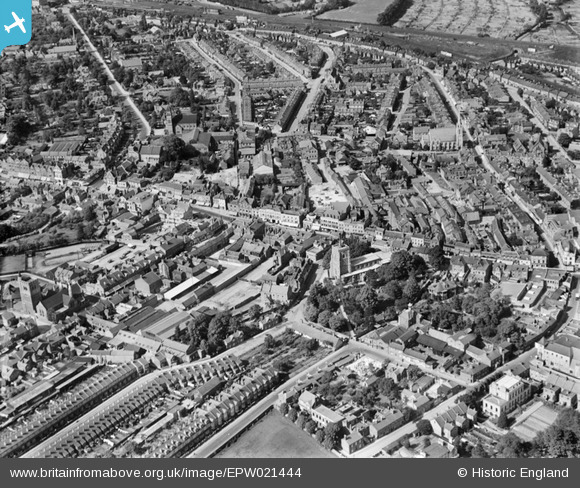 A fine view over the old town taken towards the end of the decade when the population of Watford had passed 50,000, but still most of the commercial activity was concentrated along the High Street or in adjoining properties. 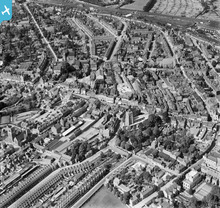 During the 1920s and 1930s, Watford still had the appearance of an old-fashioned medieval market town and these times were captured for posterity by the long-running "Watford Observer" as well by the excellent images from the Aerofilms' collection. A view of the medieval-like market town of Watford during the interwar years when the population grew from 45,000 in 1921 to almost 57,000 in 1931, and the ancient market was still being held in the High Street until the close of the decade. Much of this scene has since been cleared to make way for Watford's new road system, from the 1960s onwards, although the Grade I Listed Parish Church and Holy Rood RC Church remain. 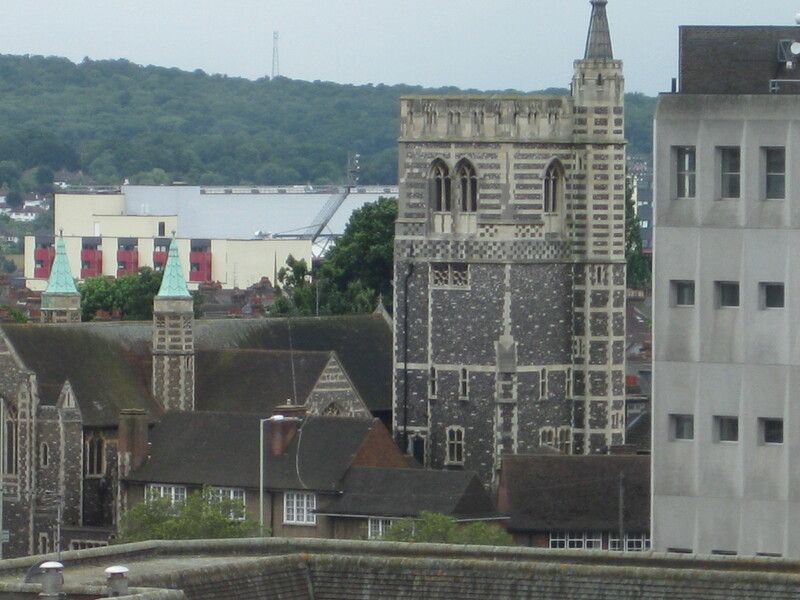 As a youngster growing up in the South Oxhey of the 1950s, two miles south of the town, the Watford skyline was dominated by the three or four main church buildings, each with its distinctive tower or spire. Three of these fine buildings are extant, but they are no longer the dominant features of the townscape. 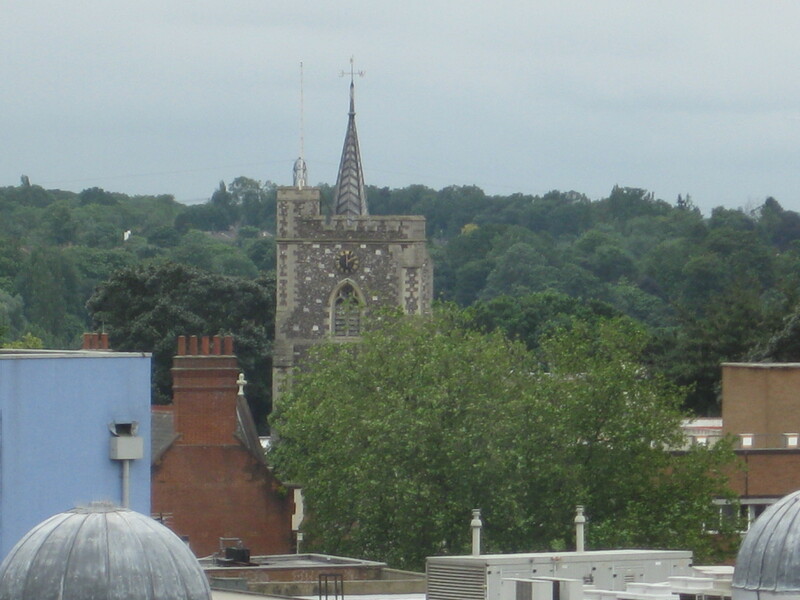 This picture of the Grade II listed building of Holy Rood Church was taken by the writer on Monday, July 2, 2012, from the top floor of Jury's Inn hotel, Clarendon Road, Watford. Holy Rood RC Church in Market Street is officially a Grade I Listed Building and was designated on September 12, 1980, and is one of only two in the town. Source: The Book of Watford, 2nd Edition, Bob Nunn, 2003. The Grade I listed building of St.Mary's Parish Church, Church Street, Watford, is mainly a 15th century creation with a broad, Herts-type west tower and lead spirelet. Major restoration was undertaken in 1871, when the distinctive flint facing was applied to the exterior walls. The writer climbed to the top of the tower with an O-level Art group (Watford Boys' GS), led by teacher Mr.J.R.Smith, in the spring of 1959. This photograph was taken 53 years later, from the 6th floor of Jury's Inn, Clarendon Road, on Monday, July 2nd, 2012.